To calculate blends in the WineCalc app, you select the blends calculator. 1.) Select the blend tool from the bottom menu bar. 2.) 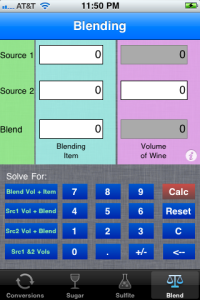 Select “Solve for: Src1 volume + blend” button from the left side buttons in the keypad area. 3.) 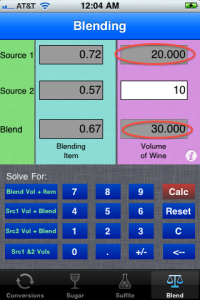 What this does is allow you to enter Src1 acid, Src2 acid, and Src2 volume as well as the desired target acid level in the Blend, and the calculator will calculate Src1 amount to blend with your Src2 amount to achieve the correct blend values, and display these for you. You have two wine batches. Src1 has 0.57 acid, while Src2 has 0.72. You want to create a blend that has an acid of 0.67. Enter the information requested into the fields shown. The other buttons in the left side of the keypad show similar types of calculations. 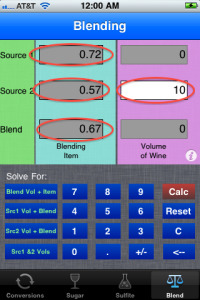 Experiment by selecting each item and watching as WineCalc highlights the fields you must provide information. The results will appear in the non-highlighted fields when you press the Calc key. I hope this short tutorial has been of some help. To back up all your data from winemaking, there are three ways to proceed. The first way just uses iTunes and the normal process used by the iPad for all backups. The second and third ways allow you to back up your data to csv files – either your individual journal entries, or a whole batch at a time. But this way doesn’t restore back into the iPad. It is simply a way of storing your data off of the device. To back up your data using the iTunes backup method. Attach your iPad to your computer. Perform a sync to ensure all your data is the way you want it with respect to your other apps on the device. Once the sync is complete, and your data is updated in the way you want it to be backed up in winemaking app, then from iTunes, right click on your iPad entry in the left side pane of the iTunes user interface. After right clicking on your iPad named in the left panel, a popup menu shows some options. One of the options is to back up your iPad. Select this option now. After some time, the backup will complete. When it is finished, you will have a copy of your data for all your apps stored on your computer. Plug in your iPad to your computer you made the backup on. Right click the iPad in the left pane of the iTunes user interface. From the popup menu that appears, select “restore from backup”. A dialog box shows the backups you can select (from all the previous backups you have performed). Select the backup you want to store, and iTunes will restore the data to the iPad for you. Once completed, run winemaking to see all your data restored to the state it was in when you saved it last backup time. 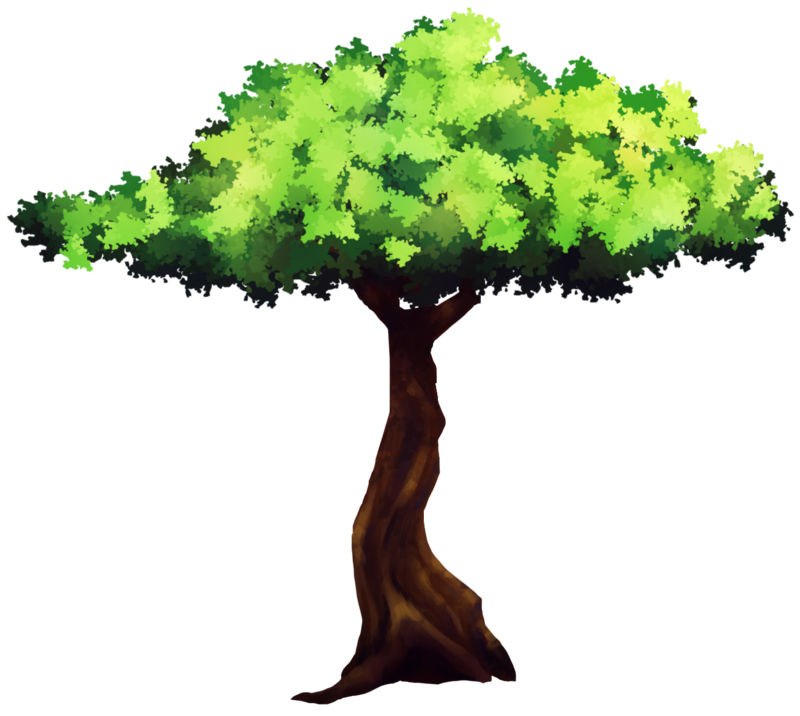 Backing up your data using csv file formatted data preserves your data against total loss, but at this point in time, winemaking app cannot restore from csv files. On the right side of the batch display page, there is an action icon in the toolbar. Select the action icon, and when the popover box is shown, select email batch data. When the email client pops up, select your email addresses to send the data to and press send. The data should be sent to the email address given with an attached file containing comma separated values readable by a spreadsheet program like excel or numbers. Remember to perform backups regularly to preserve your data against loss.